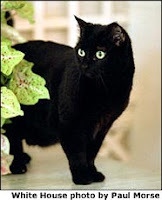 OK, so it's not technically a "cute" thing, but we did just want to pass along that the Bush's pet cat, India, died today. India was 18 years old, and according to her bio, she loved to stay and inside and visit the White House Library. Her favorite book was If You Take a Mouse to the Movies by Laura Numeroff and Felicia Bond. Labels: cat, family, news, politics, R.I.P.